How to Save Money - How 10 Minutes a Week With My Husband is Saving Me $100 a Month! You Are Here >> Home » Frugal Living » How to Save Money » How to Save Money – How 10 Minutes a Week With My Husband is Saving Me $100 a Month! 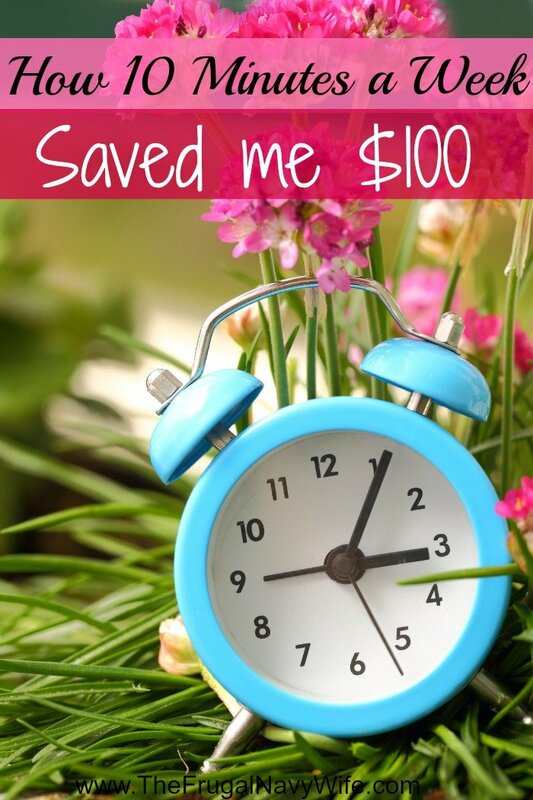 How to Save Money – How 10 Minutes a Week With My Husband is Saving Me $100 a Month! So about 2 years ago we let our budget get the better of us. We would sit down at the end of each month tally up our budget for that month and budget for the next month. That is the ONLY time we would do our budget. Then one month our grocery bill was $200 over budget, AND our eating out budget was over $600! That was $800 we could have put into savings instead it was gone. We knew we needed to figure out how to save money or we would be in trouble! At the time hubby was still in the military, we has 2 kids and I wasn't really making any money yet. I was just figuring out how to. So we were on a VERY strict budget! We were living in housing. For those non military people that means we did NOT get our housing allowance (at the time it was $1600 a month for our area) that money went to the housing company BUT we did not pay rent, or electric, or water, or gas and the yard maintance was taken care of ect. You still have to pay for internet, TV, and phone bills. So we made an agreement to sit down with each of his pay checks on the 1st and the 15th of each month and budget the money. We were able to get our spending down a bit more but really there wasn't much wiggle room to put money into savings as we started to pay off our debt. We also started trying to find ways to save money. We read America's Cheapest Family Gets you Right on the Money and Suddenly Frugal looking for way to cut costs and found some great tips. So I started looking for easy ways to make some extra money. After all if you need more money bring it in right? I started earning free Amazon Gift Cards with sites like InstaGift Card, Swagbucks and GiftHulk. They were great for less than 30 minutes day I was earning about $300 in Amazon Gift Cards a month (I still do!) I also now use Superpoints as well. I then took that $300 and got things like diapers, toilet paper, laundry soap, also food and birthday and christmas gifts needed. So we knew something was going to have to change. So we started sitting down every week. The first month we did this our budget was the same as the past few months but sitting down for the 10 minutes and working out our budget on Mint and that month we were able to put $100 in to savings! So we have kept it up. Sitting down for 10 minutes a week and going over the budget and we have been able to build our savings. It really works when baby #4 was born that month we didn't have our weekly sit downs and we over spent! The following month back to our weekly sit downs and our budget was right back on track! We still have those 3 books and re read them from time to time, tips we passed over before are now relevant and we can use. We have read several other books as well always looking for tips and tricks to use! No matter what we sit down every week after the kids are in bed and go over our budget, sometimes with a dessert to share sometimes with a glass of wine but we make it fun and do it together and every month we have been able to put at least $100 in savings, now that we have been doing it over a year we are able to put away more! We recently started using Digit (use my link so you don't get waitlisted! Read more about Digit here.) it helps us save money without having to really think about it by analyzing out spending patterns! It's free to use! It has helped us save about $50 – $100 more month! Follow me on Facebook, Twitter, Pinterest, Instagram and YouTube for more ways to save!